😊😊😊 Can anyone suggest a gripping crime/detective thriller novels? I loved “The Secrets She Keeps”, by Michael Robotham. “Behind Her Eyes” is also fabulous. I am Pilgrim by Terry Hayes. It is thrilling and and so well written! You have inspired me to buy the hardcover of this book. Something I very rarely do these days. Anything by John Sandford or Michael Connolly. Tana French is also great. I was just going suggest any Chelsea Cain book! I AM PILGRIM is as gripping as it gets! Anything by Michael Connelly, Robert Crais or Dennis Lehane. I could >not< get into this (Pilgrim). I felt like it was 50 pages of telling and info dump... and I put it down shortly thereafter. Is there any action in it at all? Amanda Yes, there’s a lot. The Monkey’s Mask by Dorothy Porter … it’s in verse, but brilliantly written. I just read the first one, Dead Simple, and loved it! The Scarpetta series by Patricia Cornwell. I believe it starts with “Postmortem”, if I remember correctly. My favorite crime novels of all time. Love the early Cornwell books,not so much the last few. She did change voices and tenses about 12 books in and it threw me off, for sure. Loved the first ones but I can’t stand the ones that are all about Lucy. I tried that one and couldn’t get into it. I’m not sure what my problem was. Donald Westlake’s Dortmunder series of crime novels is smart (even though some of Dortmunder’s criminal colleagues aren’t), and uproariously funny. Bank Shot, one of my favorites, is sure to grab you in spite of pregnancy brain. Elizabeth George novels. Addictive, wonderful well developed characters in the series. Lee Child – Jack Reacher books. Agree. Easy to read but interesting. Just don’t imagine Tom Cruise as Reacher-so awful! Melanie so bad. Not hulky or 6’4″ and blonde!! And his chick-lit books are excellent if you’re into those. Anything in Jo Nesbo’s Harry Hole-series. I read them in Norwegian, but I have heard that the English translations are excellent. Stephen King’s Mr Mercedes is an easy read. It’s very good but not too taxing if you’re not looking for something too heavy. The Dry by Jane Harper, the audiobook is great with the Aussie accents, The Passenger by Lisa Lutz (go girl power), American Housewife: Stories, by Helen Ellis, very funny stuff. Departure by A.G. Riddle, if you liked Lost (tv show) you will like this. Good luck, don’t feel bad about not finding something you like, it happens. There are SO many books in the world. I will give a book a second chance later on, because maybe it was just my mood at the time. If I don’t like it twice, out it goes. Congrats on the baby! Totally agree about The Dry. Once again, I will mention Laurie R. King. This time her Kate Martinelli series. It starts with A Grave Talent. John Connelly’s “Charlie Parker” series. I really enjoy the Camilla Lackberg books. The series is called “Patrik Hedstrom” or “Fjallbacka” series. She’s a Swedish author and I think there are 8 out and translated into English. You can get some of them in epub format from ebook.bike for free. If you decide to try them I suggest you do read them in order if you want to follow the lives of the main detective. I’d be interested to hear what you think. I’ve recommended them to a few people and they’ve enjoyed them. The Chemist by Stephanie Meyer. Kept me totally engaged. Laura Lippman, lots of good mysteries. More mysteries then thriller – but love Louise Penny Inspector Gamache series. Also enjoy Prey series with Lucas Davenport by author John Sanford. I was going to recommend the Inspector Gamache series by Louise Penny too. Agree, read them in order. I believe that ‘Still Life’ is the title of the first book. 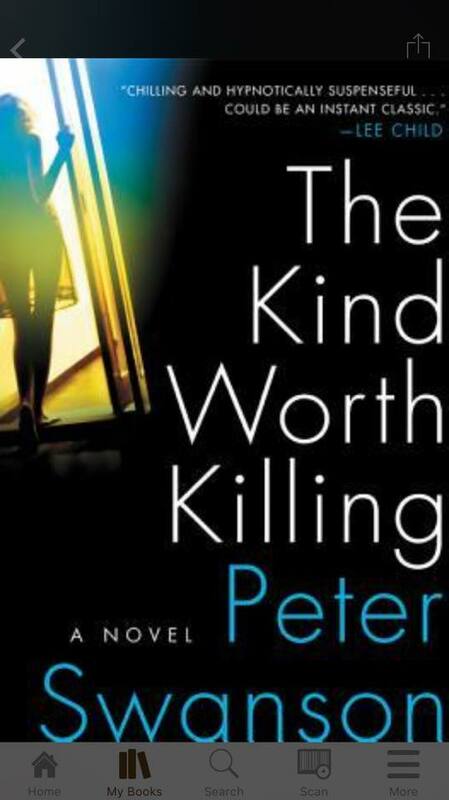 They aren’t thrillers, but they are great crime mysteries that are really character driven. I LOVE this series. I recently read Boar Island by Nevada Barr. Good detective thriller. Also liked You Will Know Me by Megan Abbott. I was recently reminded of a terrific series I read years ago and loved. I’m planning to listen to the first in the series on audiobook in December on a road trip with my family. Hoping they’ll love it as much as me and maybe it would be a good series for you also. A strong interesting older female character. It’s the Mrs. Pollifax series by Dorothy Gilman. Any other fans out there? I loved the Pollifax series. Read them when they first came out in the 1970s, 80s. I reread a couple recently and seemed dated so not quite as good as when I first read them but still enjoyable. Ruth Rendell’s Detective Wexford mysteries never disappoint. Haven’t checked the thread so please forgive if this has already been suggested. I agree. Great series. Also P.D. James and John Sandford. Linda Fairstein. Alex cooper novels. An NYC prosecutor. Great series. ALL of Michael Connelly’s books are fabulous- I think he is the best mystery writer out there. By Reason of Insanity by Shane Stevens is by far the best crime novel I have ever read. Child 44 by Tom Rob Smith is fantastic! It’s been around awhile so you may have read it already. All books by Tana French are fabulous. Also like series like Louise Penney, Elizabeth George, Anne Perry, Michael Connelly. All should be read in order. T. Jefferson Parker, esp. Pacific Beat, Silent Joe, and the Merci Rayburn series. Just read Wendy Corsi Staub’s Blood Red. Very good. And Janelle Brown’s new Watch Me Disappear. Also great. I really like several Scandinavian authors…Jo Nebsco, Henning Markell, Camilla Lackberg, Stieg Larson (The Girl with the Dragon Tatoo- series) I also like Greg Iles series in Mississippi-best read in order. Inherit the Bones by Emily Littlejohn The detective is pregnant! Nutshell by McEwan read while pregnant! Anything by Agatha Christie 🤗 also Dominance by Will Lavender, as well as his other book Obedience. Tana French books are all great and don’t have to be read in order. Same for Dennis Lahane. His books are different each time. Lots have been made into movies. Robert Parker’s Spenser series. Its fun to start at the beginning and watch the evolution of both characters and the author. An easy but satisfying read. The man on the train by Patricia Highsmith. Barbara oh yeah, that’s it. No one has mentioned Sue Grafton. I have not read her books but am about to start A is for Alibi. Should I not? Rosalie interesting. Thanks. I will give the book a try but sounds like I will not like it. I have heard so much about her books esp the newest. I read hardly any crime/mystery. I have read Still Life & liked it alright also Sweetness at the Bottom of the Pie which I loved. That is about it. I loved her books and have read all of them. Interesting characters that you look forward to finding out what they are doing in the next book. I love the Mr. Mercedes series by Stephen King and Tana French’s Dublin Squad books. Both pretty dark but excellent and amazingly written. I also like Sue Graftons Alphabet series. I am a big Stephen King fan….I actually think his writing is even better now than some of his earlier books, which at the time I thoroughly enjoyed. My husband is completely hooked on the Jeffrey Archer Clifton Chronicles, but they’re more thriller/action books. What about Nicci French’s “Frieda Klein” novels with the weekdays in each of the titles (starting with Blue Monday)? The Dublin Murder Squad series by Tana French. Steve Hamilton, Faye Kellerman, Jo Nesbo, Donna Leon, Peter Robinson, Ian Rankin….